On bad days, 5:00 p.m. rolls around and panic strikes the heart: oh, no - what’s for dinner?! Either something is cobbled together from fridge and pantry, snacks are inhaled over the sink, or takeout saves the night. It happens. But then there are days when all the pieces just fall into place. When careful planning is brought to fruition with exciting, balanced, varied menus and plenty of leftovers for future meals. Who wouldn’t like more of that? This discussion is for the planners and aspiring planners among us. What dinners do you have on tap this week? If you have recipe links, feel free to share them. And because life rarely follows a script, how your good intentions work themselves out in reality can be reported in the “What’s for Dinner” thread. So, what meals do you have in mind? Post a whole week or as many meals as you have figured out. Anything special planned for Easter, Memorial Day, etc.? Meals marked with a star contain perishables that need to be prioritized. I also noted if a meal is based primarily on frozen or shelf-stable ingredients. Hopefully we can make our way through this without too much waste. Too many meals out recently, catching up with friends. About the same for the weekend and next week too. Sat - Out with visiting friends. Sun - GOT viewing; friends will probably cook. I made mini Vietnamese-ish meatballs and will also make dessert - caramel custard, buttermilk panna cotta, or a baked yogurt custard. Mon - Fava beans in a green coconut sauce. Tues - Out with friends for a farewell. Wed - Dinner out before a play. Thurs - Taking my cousin out. Fri - TBD, maybe spiced roast chicken (thighs) with vegetables. Focusing on lunches given all the dinners out: carrot soup, curried lentil soup, mushroom barley salad (Nobu dressing) and a Vietnamese cabbage slaw to accompany leftover meatballs. Very nicely structured and organized. 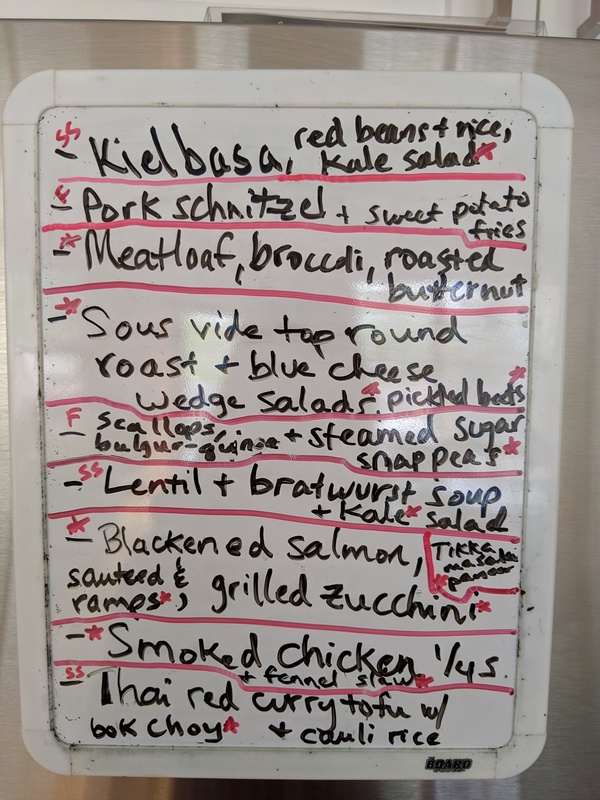 I am leaning towards the Lentil & Bratwurst soup , with a nice side of some of your Red Thai Curry Tofu…Just saying? pepper flakes, 2T minced cilantro, 3T lemon juice. degrees until done (25 min). This will be hot (as in piquant).